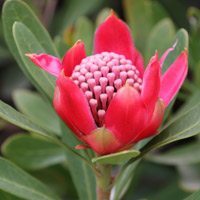 The Waratah plant is one of Australia’s most spectacular flowering plants, they are Telopea species. The brilliant red flowering Telopea speciosissima being the floral emblem of New South Wales. An iconic Australian plant that with judicial pruning will form a dense bush, its flowers are feature gardeners look for. Seen in all its glory in spring the blooms making a great display in the garden as well as fantastic cut flowers. Found growing along the east coast of Australia from Northern New South Wales to Tasmania. 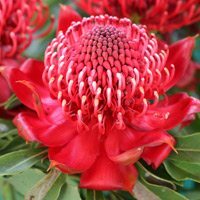 Waratah plants are available for sale from most good specialist Australian plant nurseries, usually in late winter to spring when they are in flower. Remember a well drained soil and a sunny position are the essential elements to successfully growing these beautiful flowering plants. These plants can be successfully grown in pots or containers, or in the garden in a well drained soil. Full sun to part shade these frost tolerant plants can be cut back or pruned after flowering to maintain shape and promote more flowers for the following season. Telopea work well in light shade, they naturally an under-story plant, and they will attract nectar seeking birds to the garden. In deep shade however they tend not to flower as well. As older plants develop lots of hard wood, Telopea can be rejuvenated by cutting right back to the crown. These are a plant that have lignotubers and so will re shoot. This mimics the effect of bush fires to some extent, the natural rejuvenate of many Australian plants. T. oreades – Gippsland Waratah – Vic. 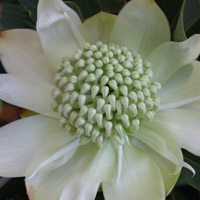 As well as the red varieties The White Waratah (Telopea speciosissima x oreades) and a yellow flowering cultivar (Telopea speciosissima x truncata x oreades)are also available. T. speciosissima ‘Wirrimbirra White’ was one of the first named white flowering cultivars. T. truncata is the Tasmanian Waratah a smaller growing species and cultivars using it are smaller growing than those of other species such as T. speciosissima. T. oreades is the Gippsland or Victorian Waratah while T. mongaensis from NSW is known as the Braidwood Waratah. Tomoko – Late flowering with red flowers. Shady Lady® ‘Red’ – White flowers in spring. Also available in red, pink and yellow. Linda – Large red flowers in spring. Sarah Red – Smaller flowers in spring. Although in flower in spring they are best planted in Autumn if you wish to give them some time to settle in and make the most of the first flowering season. Grow in the garden or in pots or containers in a sunny position, a free draining soil is essential and care is fairly simple. Give plants room to grow to promote flowering and provide a good airflow. Pruning is best carried out directly after flowering in early summer. Heavy pruning after 8 -10 years may be required to provide plants with a ‘new lease of life’. 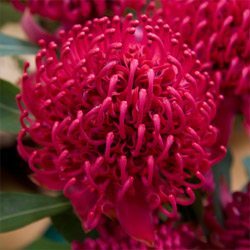 Waratah flowers make a great cut flower and are reasonably long lasting. These bird attracting plants also make excellent specimen or feature plants in the garden or as a bushy shrub at the rear of the garden border. An organic slow release fertilizer that is low in phosphorus seems adequate, once a year.